Plumbline Media Group Wins Telly Awards for 6 years, including 2010, 2011, 2012, 2013, 2014 and 2016. The Sycamore Commission is a non-profit organization that produces and conducts training in "proven life principles that provide people with hope, joy, and increased freedom to simply be themselves." Plumbline Media Group was selected to produce a promotional video that would encourage people to register for the Sycamore Commission's "Living Free" seminars. Barker Martin is a Washington and Oregon Law Firm representing Home Owner Associations. "Book Trailer" for "You Can't Make Me - But I Can be Persuaded"
You Can't Make Me [But I Can Be Persuaded] // by Cynthia Tobias from Plumbline Management on Vimeo. Stronger Families Promotional Video from Plumbline Management on Vimeo. The annual Telly Awards competition conveys recognition to outstanding local, regional, national and international video and film productions; TV commercials and programs, and Web commercials, videos and films. The award honors the very best local, regional and cable television commercials and programs, as well as video and film productions. 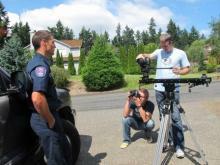 The video above won a 2012 Telly Award for excellence in Video Production. Each year more than 13,000 entries from all 50 states and numerous countries vie for what is perhaps the industry’s most prestigious and coveted award. Previous year’s winners included video productions from big names such as TV Guide Network, Harpo Studios, CBS Television Distribution and The Weather Channel, among others. Whether a television commercial, web marketing video, corporate training video, internal communications program or Fund-raising video, our award-winning team will design and deliver you message in full HD quality. Plumbline Management has assisted authors with content development, content editing, cover design, copyright protection, proofing, and printing. Our nationally published editorial and publication services team has produced both fiction and non-fiction books, workbooks, student manuals, and booklets for both the US domestic and international markets. We have also been very successful by assisting self-published authors with the initial and on-going marketing of their finished product, including assistance in establishing a presence through major online book retailers. Our print media services receive acclaim for compelling message clarity and creative graphic design. Experts with decades of proven experience will assist you to develop and implement tools that increase brand awareness, position a thought-leader, or drive sales leads to you website or front door – you pick the target, we deliver that messaging tools. Our core capacity includes graphic design, key message development, internet marketing strategies, website design, social media marketing, search engine optimizing, and promotional product design and procurement. This 3-time 2011 Telly Award recipient portrays Gig Harbor’s Dennis Trittin and his role as father, retired business leader, and author. This video highlights his reflections on his new book, 'What I Wish I Knew at 18', and its value to his teen-age target audience as well as parents, educators, and community leaders who see Trittin’s book as a resource to young adults. Dennis Trittin - What I Wish I Knew at 18 from Plumbline Management on Vimeo. Restore International is a non-profit humanitarian organization that seeks to care for children at risk in Uganda. Restore International finds audacious ways to restore justice to children all over the world. At the Restore Academy in Uganda, students are overcoming the horrors of their past and looking forward with hope. This video was shot on location in Gulu Uganda at the Restore Academy and won 2 Telly Awards in 2010. It was produced by collaboration with Plumbline Management, Danny DeWalt, Triniti Media, and Restore International. The Future Hope - Restore International from Plumbline Management on Vimeo. Social media can no longer be ignored as a vital part of a company’s marketing strategy. Even now, many companies and individuals are using some form of social media, and yet are doing so without a comprehensive or effective strategy. Our team will help in the development of your social media marketing and provide the tools to implement your strategy. This will include creating a comprehensive plan that will identify the most effective social media channel and target the social media your customers are using. Our award-winning marketing team has a professional reputation for developing clear strategies that result in company and market growth. Our singular focus is to rapidly place your business in a lead position within your industry - and to keep you there – with a strategy designed to enhance your bottom line results. The simple math: our success results from your success; we continue to grow because you have grown. Our core capacities include marketing strategy, internet marketing, search engine optimizing, social media marketing, email design and delivery, message and strategy development, and effective brand deployment - in short, we get results. We also provide strategic business development in the areas of leadership, management, marketing, and organizational development. Our expert team will provide sound business advice built around real-world business experience and proven practices.